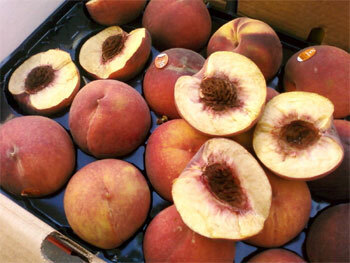 A question was submitted asking about the cause of internal browning or discoloration of peaches. From my experience, the internal discoloration that sometimes occurs in peaches is due to chilling damage. But what is unique with peaches, the chilling injury develops at warmer than expected temperatures. Peaches should be stored between 30 and 35 degrees, but 30 to 31 is recommended. The discoloration (from chilling) actually occurs when the peaches are stored at warmer temperatures, between 36 and 50 degrees. Strange, isn’t it? This is due because the very cold temperatures (30 to 31) actually put the ripening process on hold, thus preventing the fruit from becoming mealy and discolored. Unfortunately, maintaining a storage temperature of 30 to 31 degrees is difficult. There are many other factors involved, such as the firmness of the peach, the size of the peach, and the maturity (% soluble solids) that affect how long a peach can be exposed at these temperatures (36-50) before showing signs of internal browning. That is why you do not always find this defect. Does anyone have any advice for the wholesalers and chain stores that may have to store the peaches for more than few days? Any suggestions or comments would be appreciated. We have had problems with peaches showing internal discoloration too. Some varieties worse than others. I assumed the problem was due to the growing conditions. Our coolers are set at the 33-35 degree range, but it may take some time for the fruit to cool down and reach that temperature. The California Tree Fruit Agreement has done extensive research on this issue and has devoted an entire micro-site to stone fruit education called Cal State PPN. Cal State PPN in a free online resource that covers the A to Z of fresh California peaches, plums and nectarines, including the proper storage and handling to avoid conditions like internal browning. Go to http://www.eatcaliforniafruit.com/csppn. You can also access it from the California Tree Fruit Agreement’s homepage at http://www.eatcaliforniafruit.com and click onto the red box Cal State PPN. I asked the USDA inspector that comes to our warehouse about this defect. I was told they only cut two fruit per sample, and if it is not found in those two, then it would not be a big deal. Is the USDA telling me they would not score this defect, unless over 50% of the peaches had this internal discoloration (1 out of 2)?